Today is World Teachers’ Day, which is held annually on 5 October as part of a UNESCO initiative to appreciate, assess, and improve the educators of the world. In this spirit, almost everyone can name a teacher they had in school who played an important role in inspiring, encouraging and challenging them to further their interests and studies. I am blessed to have had many great teachers during my K-12 and university education in Alberta but there are two Social Studies teachers who I credit for playing big roles introducing me into the world of Alberta politics. During the 1997 provincial election, as part of my Grade 8 Social Studies course at École Georges H. Primeau School in Morinville, we were given an assignment that required us to collect news paper clippings of media coverage of the election. Each evening, after my parents had finished reading the papers, I studiously cut out relevant news stories from the Edmonton Journal, the Morinville Mirror and St. Albert Gazette, and glued them into a scrapbook. I cannot remember whether I was asked or if I volunteered, but my teacher, Al Meunier, was organizing an all-candidates forum at the school and was looking for student volunteers. Each of the election candidates was to be introduced by a student at the start of the forum and I was chosen to introduce and read the biography of Tom Turner, the local New Democratic Party candidate. I remember not completely understanding the differences between the candidates, but I do remember starting to pay more attention to Alberta politics after that event. Three years later, Andrew Raczynski, an excellent teacher who had taught my Grade 9 Social Studies and English courses announced that he was running for the nomination to become the local provincial Liberal candidate in the next election. Unlike most rural areas in Alberta, the community I grew up in had a unique history of electing Liberal MLAs (Nick Taylor in 1986, 1989 and 1993 and Mary Anne Balisilie in a 1996 by-election). The PC candidate had only narrowly captured the constituency in 1997. I had become more politically aware after the Progressive Conservative government attempted to ram through a law allowing for increased privatization of health care in Alberta. As a budding politico and soon-to-be voter, I was a impressed when I received personalized responses to letters I had sent to Liberal leader Nancy MacBeth and NDP leader Raj Pannu about my concerns with increased privatized health care. I eagerly jumped at the opportunity to volunteer on Mr. Raczynski’s campaign. I was elected as a director on the local constituency association board and over the next year I campaigned alongside the candidate in communities across the sprawling rural Redwater constituency. I knocked on doors in every hamlet, village and town in the constituency and attended more rodeos, parades, town fairs and demolition derbies than I ever imagined existed. It was a great time. I learned a lot about politics and about the people in that area of Alberta. And even though the campaign was not successful in getting Mr. Raczynski elected (not for lack of hard-work, it was a really bad election year for Liberals in Alberta) it was a worthwhile experience. I was hooked on politics. Soon after the campaign ended, I moved to Edmonton and began studying Political Science and History at university. I continued my involvement in party politics and became active with the Students’ Union at the University of Alberta, which led to an increasing interest in communications and media. Mr. Meunier and Mr. Raczynski were two teachers who played a big role in sparking my interest in Alberta politics. Without them, I might have become involved in politics in some role but likely not through the same path. I thank them for challenging me to think critically about my own views, giving me an opportunity to become involved and encouraging me to pursue my interest in Alberta politics. Photo Above: Me (left) with two teachers who helped spark my interest in Alberta politics, Andrew Raczynski (centre) and Al Meunier (right), at a 2014 rally featuring Liberal leader Justin Trudeau in Edmonton. This entry was posted in Alberta Politics and tagged Al Meunier, Alberta Liberal Party, Andrew Raczynski, Edmonton Journal, Justin Trudeau, Mary Anne Balisillie, Morinville, Morinville Mirror, Nancy MacBeth, Nick Taylor, Raj Pannu, Redwater, Social Studies, St. Albert Gazette, Tom Turner, World Teachers' Day on October 5, 2016 by Dave Cournoyer. 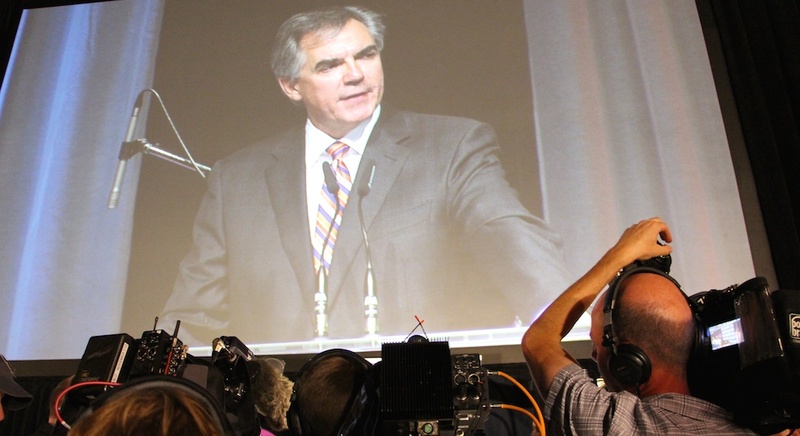 Jim Prentice was selected as leader of Alberta’s PC Party and the next Premier of Alberta on September 6, 2014. As newly selected Progressive Conservative leader Jim Prentice begins his transition into the Premier’s Office (having just named his transition team), attention will soon turn to a provincial by-election that will allow the new premier an opportunity to be elected as an MLA. In advance of the impending by-election (or by-elections), I have taken a look at the nine provincial by-elections that have been held over the past twenty-years in Alberta. Only two of the nine by-elections have resulted in constituencies changing hands between different political parties. Those two by-elections, Calgary-Elbow in 2007 (won by Liberal Craig Cheffins) and Calgary-Glenmore in 2009 (won by the Wildroser Paul Hinman), were followed by general elections which resulted in PC candidates recapturing the seats for their party. With the exception of Edmonton-Highlands, which elected current NDP leader Brian Mason in a 2000 by-election, PC candidates were elected in each of the other eight constituencies in the following general election. 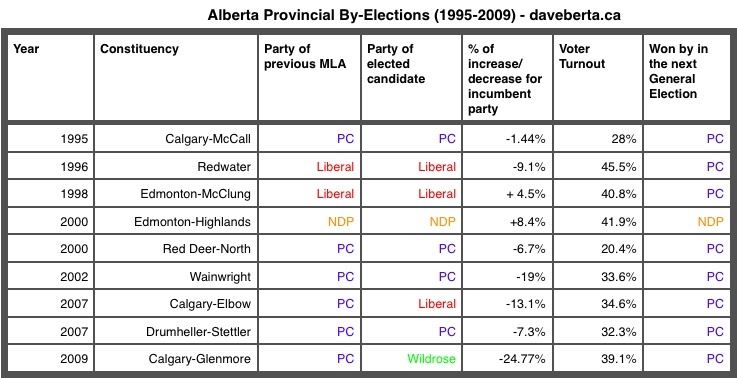 In the six by-elections where there had previously been a PC MLA, the governing party saw its percentage of the vote decline. This occurred most drastically in the 2009 Calgary-Glenmore by-election, where the PC candidate support dropped by 24.7% compared to the previous general election (the Wildrose saw its share of support increase by 28.8% in that by-election). Voter turnout ranged from a low of 20.4% in the 2000 Red Deer-North by-election, held to replace PC MLA Stockwell Day who resigned to run for the leadership of the Canadian Alliance, to 45.5% in the 1996 Redwater by-election, held to replace Liberal MLA Nick Taylor who had been appointed to the Canadian Senate. Mr. Prentice has publicly said that he plans to run in a by-election in his home city of Calgary, but not in former Premier Alison Redford‘s now unrepresented Calgary-Elbow constituency. Third-term PC MLA Neil Brown has said that he would resign to allow the new premier to run in a by-election in the Calgary-Mackay-Nose Hill constituency. There has also been some speculation that Calgary-Klein MLA Kyle Fawcett could resign to allow Mr. Prentice to run in a constituency overlapped by his former federal riding of Calgary-Centre North. This entry was posted in Alberta Politics and tagged Alberta by-elections, Brian Mason, Calgary-Centre North, Calgary-Elbow, Calgary-Glenmore, Calgary-Klein, Calgary-Mackay-Nose Hill, Calgary-McCall, Craig Cheffins, Drumheller-Stettler, Edmonton-Highlands, Edmonton-McClung, Jim Prentice, Kyle Fawcett, Neil Brown, Nick Taylor, Paul Hinman, Red Deer-North, Redwater, Stockwell Day, Wainwright on September 8, 2014 by Dave Cournoyer. 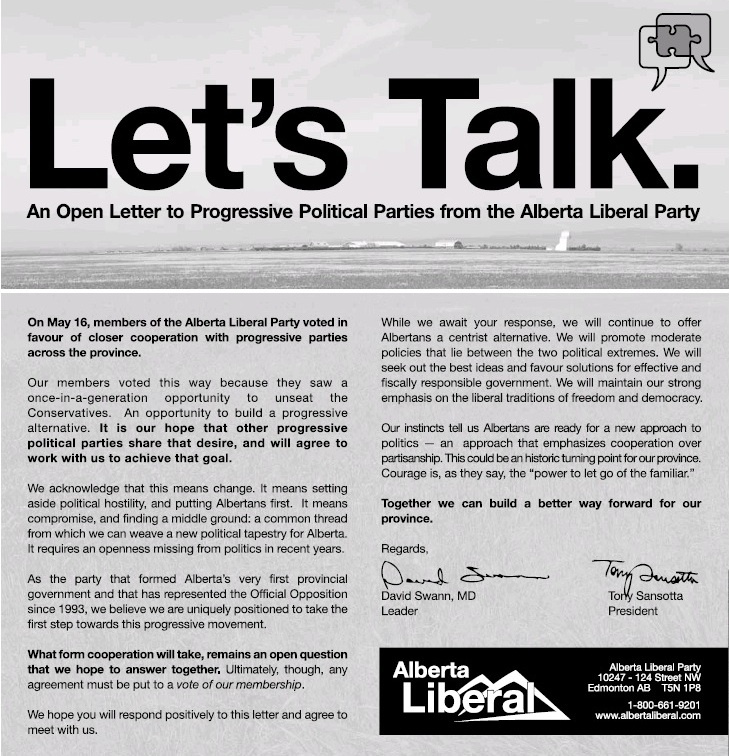 Alberta Liberal merger with federal Liberals an idea worth considering. Provincial Liberal leader Raj Sherman wants his party to work more closely with the federal Liberal Party. Conventional wisdom would inform us that the Alberta Liberals should always do everything in their power to distance themselves from their federal cousins, who remain tainted in the province after a long-string of historical grievances and well-curated myths. But has distancing the two parties helped either party? With Justin Trudeau expected to become leader of the Liberal Party of Canada in the next few months, could a second-wave of Trudeaumania help boost support for the provincial Liberals in Alberta? Since the 1970s, the two parties have been officially independent with varying degrees of unofficial cooperation and confrontation. Both parties have achieved limited success in pockets of the province at certain points over past twenty years, but support for both parties has dwindled over the past decade. The Liberal presence shrunk to five MLAs in last year’s provincial election and the federal Liberals last successfully elected a candidate to Parliament from Alberta in the 2004 election . 2001 election: 276,854 votes, 2012 election: 127,645 votes. 2000 election: 263,008 votes, 2011 election: 129,310 votes. If a merger with the NDP, Alberta Party, and Greens, as has been suggested by Calgary-Buffalo Liberal MLA Kent Hehr, is unpalatable to Dr. Sherman, perhaps he could be convinced a merger with his party’s federal namesake would not be a bad idea. Sharing their limited resources, as the provincial and federal New Democratic Party do officially and the Wildrose Party and Conservative Party have done unofficially, could provide stability in membership, fundraising, and organization for the two Liberal Parties in Alberta. A merger could also cut costs on duplication of resources (the two parties currently operate separate offices located opposite each other on Edmonton’s 124th Street). The two parties already share many members and candidates are frequently seen listed on the ballot under both party banners. There are also no shortage of former Liberal MLAs who have tried to kickstart a career in Ottawa, though all of them unsuccessful. Liberal MLAs Ken Nicol and Debby Carlson ran as federal Liberals in the 2004 election and Sue Olsen and Frank Bruseker stood in the 2000 federal election. Former party leaders Grant Mitchell and Nick Taylor were appointed to the Senate on the advice of federal Liberal Prime Ministers. Even Dr. Sherman was a member of the federal Liberals before he was elected as a Progressive Conservative MLA in 2008 (he supported Gerard Kennedy in the 2006 federal Liberal leadership contest). Calgary-Centre a spark of hope for the Liberals. Liberal Harvey Locke surprised political watchers last year when he placed only 1158 votes behind Conservative Joan Crockatt in the hotly contested Calgary-Centre by-election. Perhaps the results were a fluke, but they give the federal Liberals a sign that many voters in Alberta’s urban centres are becoming more receptive to a moderate non-Conservative alternative in Ottawa. This entry was posted in Alberta Politics and tagged Debby Carlson, Frank Bruseker, Gerard Kennedy, Grant Mitchell, Harvey Locke, Joan Crockatt, Justin Trudeau, Ken Nicol, Kent Hehr, Nick Taylor, Raj Sherman, Sue Olsen on March 18, 2013 by Dave Cournoyer. a look at the alberta liberal leadership candidates. 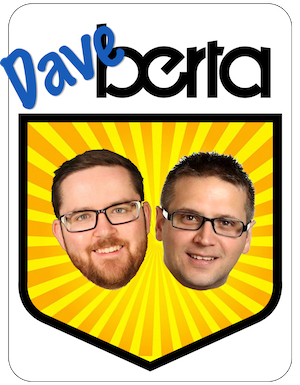 You might be forgiven if you have not paid much attention to the Alberta Liberal Party leadership contest, which is currently under way. The Liberal contest is not as exciting as the Progressive Conservative’s leadership contest, as flashy as the Wildrose (now minus the Alliance), or intriguing as the new Alberta Party, but it is important enough not to ignore. The Liberal Party is still the Official Opposition and while it has taken a beating in the polls and public image over the past few years, its next leader will play a role in the next provincial election. Elected Experience: MLA for Edmonton-Centre from 1997 to the present. Background: Laurie Blakeman is known as a vocal and unrelenting critic of the governing Tories. As Deputy Leader under party leaders Kevin Taft and David Swann, she also served as critic for Finance, the Environment, and Culture. Her strong views as an unapologetic feminist representing Edmonton’s densest urban constituency have made her an enemy to many conservatives, but her skills as Opposition House Leader have gained her respect from some Tory MLAs across the floor. She is also one half of Edmonton’s political power couple, her husband is Ward 8 City Councillor Ben Henderson. In 1998, Ms. Blakeman supported then-MLA Linda Sloan‘s leadership bid. She declined to run for her party’s leadership in 2004, telling the Globe & Mail that “she doesn’t have the fire in her belly to run” and again in 2008 admitting that fundraising was not her strength. Earlier this year she publicly mused about joining the Alberta Party, but instead decided to seek the Liberal Party leadership. (Disclaimer: I like Laurie Blakeman have volunteered for her election campaigns in 2004 and 2008). 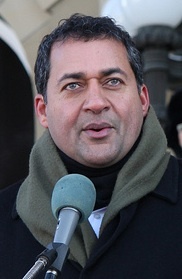 Elected Experience: Liberal candidate in Calgary-East in 2004 and 2008. Background: Calgary financial advisor Bill Harvey entered the leadership contest this week with a message that Liberals need to return to their past roots to succeed in the future. The main message on his website reminds Liberals of their 1990’s glory days under former leader Laurence Decore and is peppered with fiscal conservative language. In 2008, he ran a “law and order” and “tough on crime” focused campaign, which earned him an endorsement by Craig Chandler‘s hyper-conservative Progressive Group for Independent Business. His website says that he will be releasing a detailed platform later this month. Background: Since stepping into his role as the opposition labour critic during his first-term and making headlines over the government’s shaky handling of rotting pine shakes roofing and lack of whistle-blower protection, Hugh MacDonald earned a reputation as a dogged critic of the Tories. As Chair of the Public Accounts Committee, his focus on uncovering Tory scandals sometimes makes him appear on the verge of paranoia, but he is relentless and hardworking. It is not uncommon to see Mr. MacDonald buried in books, doing his own research in the Legislature Library. Mr. MacDonald is a dyed-in-the-wool Liberal partisan. Even if the Liberal Party is wiped off the political map in the next election, Hugh MacDonald will fight to the end (clasping a battle-axe in one hand while caped in blood-soaked battle armour under a Liberal Party flag). Inside the Liberal Party, Mr. MacDonald appeals to the stalwart crowd who believe that it is not the Liberal brand that has damaged their party, but that party members who have not adhered enough loyalty to the Liberal brand are responsible for the party’s 80 years of electoral defeat. Mr. MacDonald has the endorsements of former party leaders Nick Taylor and Ken Nicol and former MLAs Bill Bonner and Yolande Gagnon. Background: An unknown outside some Calgary political circles, it is difficult to know whether Bruce Payne is actually a serious candidate in this contest. 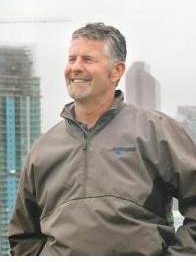 A long-time union leader, in 2007 he led the 6,000 southern Alberta carpenters union as it and seven other construction unions threatened Alberta’s first multi-trade strike in almost 30 years. He was later the Spokesperson for the Alberta and Northwest Territories Regional Council of Carpenters and Allied Workers and President of the Building Trades of Alberta Southern Council. His 87 Strong slogan is in reference to the 87 constituencies that will be created when the next election is called. His campaign also takes a shot at the current Liberal MLAs and their tendency to attack the Tories for every “scandals, faux-pas, screw-ups, miscues and arrogant decisions” without a long-term strategy. His campaign manager is the former Liberal Caucus communications director Neil Mackie, who departed from his job at the Assembly earlier this year. Background: Former Tory MLA Raj Sherman could be both the wildcard and the front-runner in this contest. Six months ago he wanted nothing to do with the Liberal Party as he sat in the PC caucus as Parliamentary Assistant to the Minister of Health & Wellness. Since writing the bluntly-worded email that led to hm being kicked out of the PC caucus, Dr. Sherman has attained a folk hero status among many Albertans. After opening up their leadership vote to any Albertan without having to purchase a membership, I have a difficult time seeing Dr. Sherman as anything but the front-runner in this contest. Dr. Sherman has the support of former MLA Bharat Agnihotri, and I have been told that Calgary-Buffalo MLA Kent Hehr and Calgary-McCall MLA Darshan Kang are lending their support to his campaign. There may be a sixth candidate to enter this contest. Word on the street is that the executive of a medium-sized Calgary-based energy company may announce his candidacy next week. This entry was posted in Alberta Politics and tagged Ben Henderson, Bharat Agnihotri, Bill Bonner, Bill Harvey, Bruce Payne, Craig Chandler, Darshan Kang, David Swann, Hugh MacDonald, Ken Nicol, Kent Hehr, Kevin Taft, Laurence Decore, Laurie Blakeman, Linda Sloan, Neil Mackie, Nick Taylor, Raj Sherman, Yolande Gagnon on June 25, 2011 by Dave Cournoyer. not seeing the forest for the trees: swann’s departure will change little. 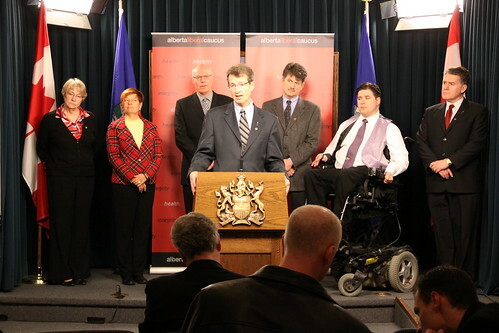 After a tumultuous two years as leader of Alberta’s Liberal Party, Calgary-Mountain View MLA David Swann announced that he will not lead his party into the next election, and that he will formally submit his resignation after the Spring Session of the Alberta Legislature. 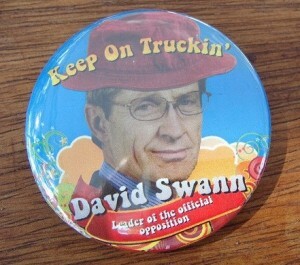 Dr. Swann is a good person and one of the kindest souls in provincial politics. Realistically, he never stood a chance as his party’s leader despite these qualities. It would be easy to blame the dismal state of the Liberal Party on the outgoing leader, but there is a greater responsibility belonging to members of a party establishment who played a central role in creating a dysfunctional political culture. Starting with the quick leadership contest after the party’s devastating result in the 2008 election, the party establishment opted for political expediency, rather than taking advantage of an opportunity to reflect on the party’s future and heal internal rifts. This expediency effectively eliminated any opportunity that the party had to attract potential outside candidates for leader, limiting the pool to a handful of current and former MLAs. Dr. Swann took the leader’s chair with a mandate for change and quickly discovered that this desire for change was not shared by some MLAs and many in his party. The Party establishment’s strong connections to the federal Liberal Party and its unhealthy obsession with their party’s past successes are just two of the many psychological barriers that Dr. Swann would have immediately faced in his job. You do not have to spend much time inside the Liberal Party to become aware of how iconized their successes in the 1993 election are. As many Albertans will remember, that election saw former Edmonton Mayor Laurence Decore lead the Liberals to their best showing in decades. The establishment Liberal motto against large-scale change within their party – especially a name change – has centered around the 1993 vote. “We won 32 seats under Decore and we can do it again,” is something that I have heard countless times. Dr. Swann faced an establishment of Liberal stalwarts who could not fathom the concept of moving away from their beloved party identity (and it really is their identity). By wrapping themselves in their party identity, the party establishment always knew they were right, even when they lost. Dr. Swann challenged this identity when he tried to change the party’s name and when he offered to cooperate with other parties. With near religious vigor, the Liberal establishment has sought the perfect leader, and when their chosen one has not succeeded in the monumental task of defeating the strongest Progressive Conservative organization in Canada, they are undermined from within or simply driven out. Nick Taylor, Mr. Decore, Grant Mitchell, Nancy MacBeth, Ken Nicol, Kevin Taft, and now Dr. Swann all faced these internal divisions and saw their leadership undermined by the party establishment and their fellow MLAs because they could not appease it. A quick change of leader may appear to be an easy fix, but the departure of Dr. Swann will not solve the internal problems that have created this dysfunctional political culture. After being elbowed to the sideline by the growing narrative of the Wildrose Alliance as the next government-in-waiting, and the growth of the new Alberta Party, the Liberal Party’s biggest challenge in 2011 is to be relevant. The Liberals jumped too quickly to choose a new leader a year after the last election. Now they are stuck in the polls with a resigning leader one year before the next election. This entry was posted in Alberta Politics and tagged David Swann, Grant Mitchell, Ken Nicol, Kevin Taft, Laurence Decore, Nancy MacBeth, Nick Taylor on February 1, 2011 by Dave Cournoyer. Since Peter Lougheed catapulted from official opposition leader to Premier in 1971, Alberta’s opposition leadership have become a political graveyard for many well-intentioned and ambitious politicians. There are many reasons for this: Alberta’s tradition of electing large government majorities, the ability of the PC party to create a big-tent party, the unpopularity of opposition parties federal counterparts, and the trap of falling into an opposition mentality. Dr. David Swann is one of many Albertans who have stepped up to the daunting task and challenge of leading a party in the divisive and dysfunctional world of opposition politics in Alberta. Calgary MLA Dave Taylor gave Dr. Swann a verbal lashing when he left the Liberal caucus earlier this past year and last week Tony Sansotta resigned as President after co-signing a letter with Dr. Swann appealing for cooperation with other opposition parties. To the untrained eye, it may look like the Liberal Party is on the verge of internal collapse and maybe it is, but I struggle to think of a time when Alberta has had an opposition party not rife with internal division. Taking a quick look back at Alberta politics over the past twenty-five years, you will find opposition leaders that made positive contributions to Alberta politics, but could not withstand the meat-grinder of opposition politics in Alberta. A quick read of the list of individuals below could easily lead most Albertans to determine some of the most thankless jobs in our province indeed belong to leaders of provincial opposition parties. Nick Taylor was the Liberal leader from 1974 to 1988. 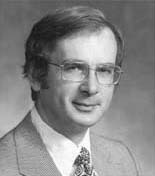 Nick Taylor (Liberal leader, 1974 to 1988): He bravely led the Liberals through the darkness and proved that even in the height of the National Energy Program that Liberals had hope to win in Alberta. In 1979, Mr. Taylor placed only 355 votes behind PC candidate Ken Kowalski in a by-election in Barrhead. After six attempts at elected office since 1968, he was elected as MLA for Westlock-Sturgeon in 1986 and was only Leader of the Liberal Opposition in the Assembly for less than two years before his position was challenged by Edmonton Mayor Laurence Decore and Edmonton MLA Grant Mitchell. He continued to serve as an MLA until 1996, when he was appointed to the Senate. Former Calgary Mayor Rod Sykes briefly led the Social Credit Party from 1980 to 1982. 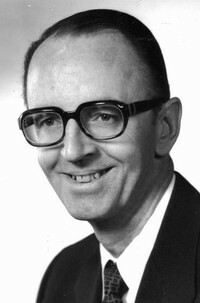 Rod Sykes (Social Credit leader, 1980 to 1982): After serving two terms as the Mayor of Calgary (1969-1977), Mayor Sykes took over the leadership of the Social Credit Party. After nine years in opposition, the party was mired with internal and financial problems which led him to resign in 1982. He later ran as a federal Liberal candidate in the 1984 election. 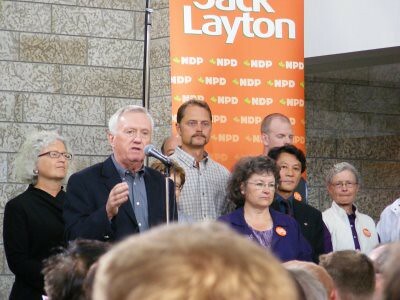 Former NDP leader Ray Martin introduces Jack Layton at a 2008 federal election rally. Ray Martin (NDP leader, 1984 to 1994): He led the New Democrats to its height as Official Opposition with 16 MLAs in 1986 and 1989, but that did not stop the internal bickering. Mr. Martin’s faced calls to resign from Calgary candidate Barry Bristman in 1989 and fought a leadership challenge by St. Paul veterinarian Don Ronaghan in 1991. In 1992, Stony Plain MLA Stan Woloshyn abandoned the NDP for the PCs. Mr. Martin resigned after his party lost all their seats to the Liberals and PCs in the Assembly in the 1993 election. He returned to the Assembly when he was elected as MLA for Edmonton-Beverly-Clareview from 2004 to 2008. Former Edmonton Mayor Laurence Decore led the Liberals from 1989 to 1994. Laurence Decore (Liberal leader, 1988 to 1994): The former Edmonton Mayor built the best political machine an opposition party had seen since the 1970s, but that was not enough for some of the MLAs in his caucus-mates. In 1993, after the Liberals won their largest vote share with 39.7% and 32 seats, a group of MLAs and party members were not satisfied with official opposition status called for his resignation. Calgary-North West MLA Frank Bruseker was stripped of his major critic portfolios after telling reporters he was worried the party could not win enough seats in Calgary to secure an election win due to Mr. Decore’s leadership. Mr. Decore gracefully resigned in 1994. Former MP Ross Harvey briefly led the NDP from 1994 to 1996. Ross Harvey (NDP leader, 1994 to 1996): The former NDP Member of Parliament was selected as leader of the seatless party shortly after he was unseated in the 1993 federal election. He was unable to satisfactorily rebuild his party after it was wiped out in 1993 and quit in 1996. He was soon replaced by Pam Barrett. Grant Mitchell led the Liberals from 1994 to 1998. 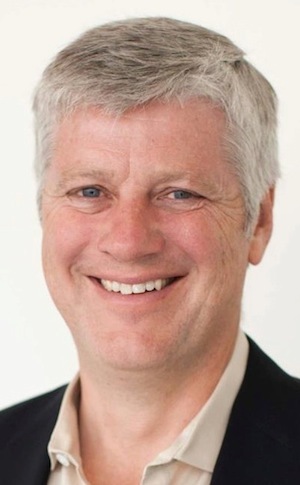 Grant Mitchell (Liberal leader, 1994 to 1998): After a brutal and divisive leadership race in 1994, Mr. Mitchell faced opposition from within his own party and caucus. Three MLAs crossed to the PCs during his time as leader and his leadership opponent MLA Sine Chadi waged a constant campaign to undermine his leadership. Shortly after the 1997 election, former Calgary MLA Danny Dalla-Longa called for his resignation. He resigned in 1998 and in 2005 was appointed to the Senate. Pam Barrett led the NDP from 1996 to 2000. 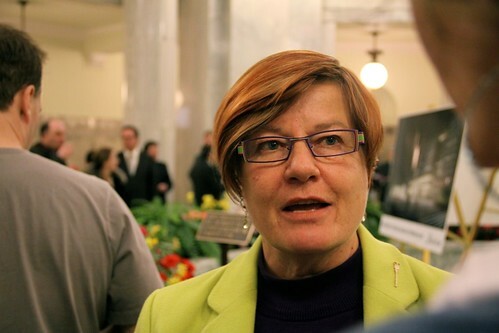 Pam Barrett (NDP leader, 1996 to 2000): After serving as MLA for Edmonton-Highlands from 1986 to 1993, Ms. Barrett returned in 1996. She led her party to elect two MLAs in the 1997 election and later resigned after a near-death experience in a dentist’s chair. 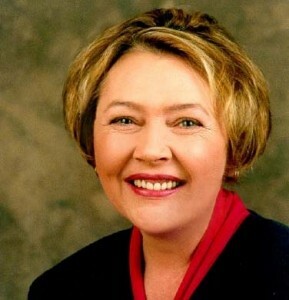 Former PC cabinet minister Nancy MacBeth led the Liberals from 1998 to 2001. Nancy MacBeth (Liberal leader, 1998 to 2001): After losing to Ralph Klein in the 1992 PC leadership race, Ms. MacBeth (then Ms. Betkowski) left politics until 1998 when she swept into the Liberal leadership. The former PC cabinet minister faced some tough opposition from MLAs within her party’s caucus, including two who crossed the floor (Gene Zwozdesky joined the PCs and Pamela Paul sat as an Independent). She resigned almost immediately after she was unseated in the 2001 election. 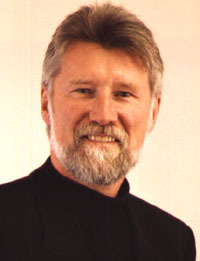 Randy Thorsteinson led the Social Credit Party from 1992 to 1999 and the Alberta Alliance from 2003 to 2005. Randy Thorsteinson (Social Credit leader, 1992 to 1999, Alberta Alliance leader, 2003 to 2005). Even after leading the long-dormant Social Credit Party to win 6.8% of the vote in 1997, Mr. Thorsteinson was at odds with his party after a movement within the party to limit the involvement of members of the Church of Latter-day Saints. Thorsteinson quit the party in April 1999 and was a founder of the Alberta First Party. In 2003, he re-emerged as leader of the Alberta Alliance – the Wildrose Alliance‘s predecessor – and led that party to earn 8.7% of the vote in 2004. He resigned after failing to win a seat in the 2004 election. 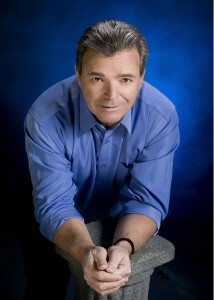 Lethbridge MLA Ken Nicol led the Liberals from 2001 to 2004. 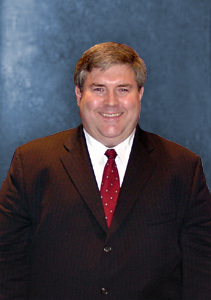 Ken Nicol (Liberal leader, 2001 to 2004): Quiet, respected, and more conservative than most of his caucus colleagues, Dr. Nicol reluctantly accepted the leadership from the unseated Ms. MacBeth in 2001. He briefly led the Liberals until internal conflict from within his party and caucus convinced him that running as a federal Liberal candidate might be a better career option. He resigned as MLA in 2004 and was defeated in his bid represent Lethbridge in the House of Commons later that year. Kevin Taft led the Liberal Party from 2004 to 2008. Kevin Taft (Liberal leader, 2004 to 2008): The first Liberal leader to increase the party’s seat total since Mr. Decore, Dr. Taft led the Liberals through two elections. He tried to distance the provincial party from its unpopular federal counterparts and while he did not face as much internal dissent from his party and caucus as did his predecessors, he did have the unfortunate task of having to remove MLA Dan Backs from the Liberal caucus. He stepped down as leader after the 2008 election and is currently the opposition Health & Wellness critic. This entry was posted in Alberta Politics and tagged Barry Bristman, Dan Backs, Danny Dalla-Longa, Don Ronaghan, Frank Bruseker, Gene Zwozdesky, Grant Mitchell, Ken Kowalski, Ken Nicol, Kevin Taft, Laurence Decore, Nancy MacBeth, Nick Taylor, Pam Barrett, Pamela Paul, Randy Thorsteinson, Ray Martin, Rod Sykes, Ross Harvey, Sine Chadi on July 18, 2010 by Dave Cournoyer. alberta liberals up in the air. Even if someone were to offer me good odds, I would be hesitant to bet on who the real players will be in the next provincial election. As David Climenhaga recently pointed out, although credible polls continue to show the Progressive Conservatives ahead in voter support, the media has continued to frame Danielle Smith’s Wildrose Alliance as the heir’s to the Legislative throne. For the most part, the free ride has continued. David Swann and the Liberal caucus. The focus of the weekend convention is policy, but the big news could be financial. The Alberta Liberal Party is expected to announce shortly that their outstanding debt, much of which was accumulated during their disastrous 2001 election campaign, will finally be paid off. This is a big step for the Liberals, but it is only one of the many challenges facing their organization. 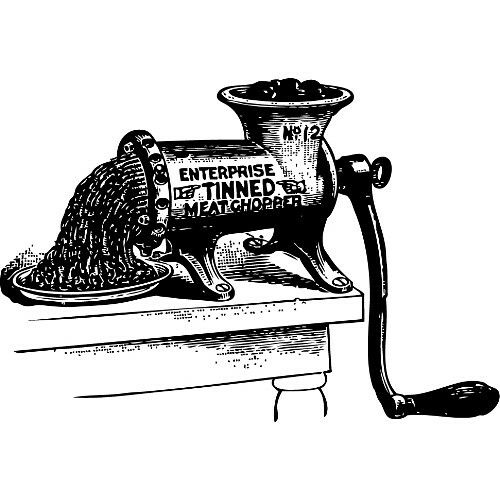 I have been accused by both MLAs and some party loyalists of having an anti-Liberal bent on this blog (one MLA even accused me of conspiring with the NDP) and while I admit to being critical of the Liberal Party, I believe that my assessments have been fair. As someone who was involved with the Liberal Party for many years, including time as a constituency vice-president and a political staffer, I am aware of the political strengths and psychological weaknesses of that organization. The Liberal Party is in an interesting situation. They might be a beneficiary of a PC-Wildrose vote split in some Edmonton and Calgary constituencies in the next election, but their membership has not exactly been flooded by progressives afraid of the two conservative parties. The departure of MLA Dave Taylor and Kent Hehr‘s decision to run in Calgary’s Mayoral election is not a ringing endorsement of the party’s current fortunes. Can the party attract back into their ranks the sizeable group of Liberals who joined disenchanted Red Tories, moderate New Democrats, and former central Albertan Greens under the new Alberta Party banner? They have been low key, but since March, the Alberta Party has held almost 100 Big Listen meetings across the province. You do not have to spend too much time inside the Liberal Party to become aware of how iconized the 1993 election is in the minds of party activists. As many Albertans will remember, that election saw former Edmonton Mayor Laurence Decore lead the Liberals to their best showing in decades by winning 39% of the vote and forming official opposition by electing 32 MLAs. Much of the traditional Liberal motto against large-scale change within their party – especially a name change – has centered around the 1993 vote. “We won 32 seats under Decore and we can do it again,” is something that I have heard countless times. There is no doubt that 17 years ago the Liberals launched an impressive campaign with a slate of candidates who were “ready to govern.” It would be difficult to argue that has been the case since. The Liberals have cultivated reliable support in a handful of constituencies in Calgary, Edmonton, and Lethbridge, but they have had a very difficult time growing their base of support. In most rural areas, the Liberals have run paper candidates in the past three elections, ceding a growing number of constituencies to the PC hegemony. The decision by the Liberal Party years ago to focus resources on urban areas has opened up the potential of rural success to the Wildrose Alliance, whose leader Ms. Smith has spent months traveling to rural communities and smaller cities meeting with any group that will have her. Her party is now reaping the benefits of gaining media attention from local weekly newspapers, organizing constituency associations, and attracting large crowds to their town hall meetings. Imagine what the political map would look like after the 2011/2012 election if Alberta had an opposition party that could elect candidates in both rural and urban constituencies. Both the Liberals and NDP have been frustrated by their lack of traction in the polls (and in elections), but neither party appears prepared to change gears to face this reality. Liberal leader David Swann has held town hall meetings across Alberta, as has NDP leader Brian Mason, but there is little evidence that this will lead to an even mediocre rural breakthrough for either party. This is probably less the fault of the current leadership and more the fault of a tradition of political tactics focused on weekly issues and electoral strategies focused on urban enclaves (and the influence of their federal party cousins). It is difficult to believe that these parties once had long-time MLAs who represented rural constituencies. NDP leader Grant Notley represented the sprawling Spirit River-Fairview from 1971 to 1984. 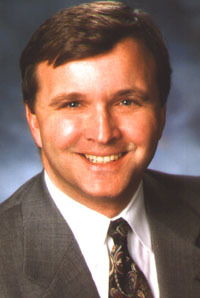 Liberal leader Nick Taylor represented Westlock-Sturgeon and Redwater from 1986 to 1996. Premier Ed Stelmach defeated two-term Vegreville NDP MLA Derek Fox in 1993. The last time either of these two parties elected a candidate in rural Alberta was in 1997 when Liberal MLA Colleen Soetaert was re-elected in Spruce Grove-Sturgeon-St. Albert. If the Liberal Party is successful in building a policy platform that appeals beyond their traditional base of supporters, will they have an organization on the ground that can translate it into electoral results? Even if they have all the best policy ideas in the world, without feet on the ground it will be very difficult – even with a potential vote split on the right – to reach beyond their traditional base of supporters in this province. This entry was posted in Uncategorized and tagged Danielle Smith, David Climenhaga, David Swann, Derek Fox, Ed Stelmach, Grant Notley, Nick Taylor, Vincent St. Pierre, Warren Kinsella on May 11, 2010 by Dave Cournoyer. 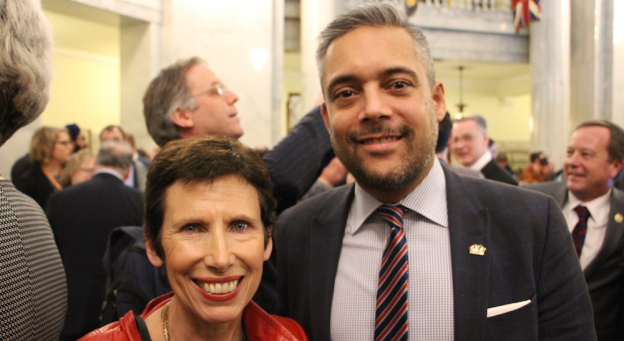 Today’s news that Calgary-Currie MLA Dave Taylor is leaving the Liberal caucus is big news for political watchers, but it is far from the first time that an MLA has left the Alberta Liberal Caucus. Due to many circumstances, ten MLAs have departed the Liberal Caucus before their term has ended over the past 16 years. 2006: One-term Edmonton-Manning MLA Dan Backs was expelled from the Liberal caucus by party leader Kevin Taft due to “ongoing friction” between the MLA and his colleagues. Mr. Back sat an an Independent MLA. After unsuccessfully seeking the PC nomination in 2008, Mr. Backs ran as an Independent and placed third behind Tory Peter Sandhu and New Democrat Rick Murti. 2004: Leader and Lethbridge-East MLA Ken Nicol and Edmonton-Ellerslie MLA Debby Carlson both left the Liberal caucus to run as federal Liberal candidates. Dr. Nicol eared 21.5% support against Conservative MP Rick Casson, and Ms. Carlson placed only 5,000 votes behind Edmonton-Strathcona Conservative MP Rahim Jaffer. 2000: Edmonton-Norwood MLA Sue Olsen left the Liberal caucus to run peruse a career in federal politics. Ms. Olsen was unsuccessful in her campaign to unseat Edmonton-Centre East MP Peter Goldring. 1999: One-term Edmonton-Castle Downs MLA Pamela Paul left the Liberal caucus to sit as an Independent MLA after domestic issues made it difficult for her to work with her caucus colleagues. She did not seek re-election in 2001. 1998: Two-term Edmonton-Mill Creek MLA Gene Zwozdesky left the Liberals over a dispute with leader Nancy MacBeth. One month later, he joined the Progressive Conservative caucus and is currently the Minister of Health & Wellness. 1996: Former leader and Redwater MLA Nick Taylor left the Liberal caucus when he was appointed to the Senate of Canada by Prime Minister Jean Chretien. 1995: Edmonton-Norwood MLA Andrew Beniuk was expelled from the Liberal caucus and sat as an Independent before joining the PCs in 1996. Mr. Beniuk was defeated by Liberal Sue Olsen in the 1997 election. Mr. Beniuk attempted political comebacks as the PC candidate in Edmonton-Glengarry in 2001 and Edmonton-Highlands-Norwood in 2008. 1994: Edmonton-Beverly-Belmont MLA Julius Yankowski and Lac La Biche-St. Paul MLA Paul Langevin left the Liberals to sit as Independent MLAs before joining the PC caucus in 1995 and were both re-elected in 1997. Mr. Langevin retired in 2001 and Mr. Yankowski was defeated by New Democrat Ray Martin in 2004. This entry was posted in Dave Taylor, David Swann, Debby Carlson, Gene Zwozdesky, Kevin Taft and tagged Andrew Beniuk, Dan Backs, Dave Taylor, Debby Carlson, Gene Zwozdesky, Jean Chretien, Julius Yankowski, Ken Nicol, Kevin Taft, Nancy MacBeth, Nick Taylor, Pamela Paul, Paul Langevin, Peter Goldring, Peter Sandhu, Rahim Jaffer, Ray Martin, Rick Casson on April 12, 2010 by Dave Cournoyer.